Microsoft’s Xbox studio arm is getting ready to churn out shows. The company rolled out a lineup of new entertainment projects at today’s NewFronts presentation to pitch the ad world on the offerings. “Our commitment to advertising is clear,” said Stephen Kim, vp for global agencies and accounts. Microsoft's Xbox Entertainment Studios showed off some intriguing interactive features for upcoming shows that give viewers more ways to connect with each other and the content. One short film called Possibilia lets viewers choose how the narrative—in this case a story about a couple's break-up—progresses with ever-expanding options of alternate scenes. “Xbox Entertainment Studios is where premium quality content meets cutting edge technology,” Kim said on stage at the James Farley Post Office in Manhattan, where hundreds of industry players attended Microsoft’s third NewFronts event. Comedian Craig Robinson hosted the event, and the band Lake Street Dive performed. Critics of Microsoft’s content strategy have noted the slow pace of development of its most-anticipated project, Halo, a series produced by Steven Spielberg and based on the hit video game. The company still has no Halo previews to show off, and the project was announced a year ago. Another series Humans won’t be available until 2015. Still, Microsoft had a number of high-energy shows in production—in the comedy, sci-fi, animation, documentary and sports categories. Microsoft executives noted that the company is well-financed and a formidable entrant into this new content world. It does have the bucks to bet on programming, but so do rivals like Amazon, Hulu, Netflix, Yahoo and Google. The company also is competing for the living room against Sony, which has sold more next-gen gaming consoles—7 million to 5 million. This show is perfectly timed for the World Cup and takes us into the world of street soccer where the gifted and gritty players display crazy talent. A documentary reveals the biggest video game flop of all time—E.T. for Atari. 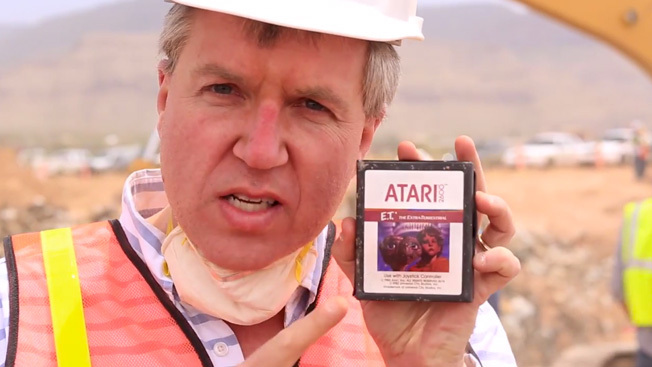 The game is the stuff of legend because it was so hyped yet was so bad, and eventually Atari tried to cover up its failure by dumping them in a landfill, which gets unearthed in the film. A show that covers familiar sci-fi ground: What would happen if robots became too like humans? Microsoft is the exclusive partner of the mega-music festival coming in June. Perhaps the most original of all the Xbox Originals in development, this show is from the creators of Cartoon Network’s Robot Chicken. It’s a funny mash-up of Candid Camera, Punk'd and starring animated characters dropped into the real world.